It's not too difficult to make the almost antique marine VHF Sailtron RT80 and the identical Sealine MC5500 suited for the recepton of AIS by adding a discriminator output. The VHF transceiver uses a conventional discriminator, consisting of a ceramic resonator and two diodes. Usually, the performance of this type of discriminator is less than that of a receiver with a more modern receiver IC. In spite of that, for the R/T 80, the results were quite acceptable. 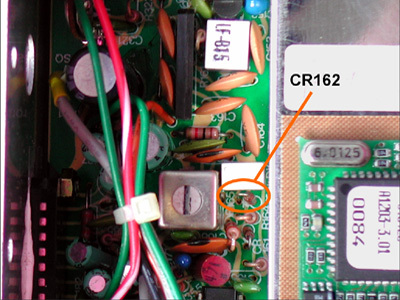 The unfiltered audio can be found on the cathode of diode CR162. This diode can be found right next to the ceramic resonator. Connect a 2.2 nF capacitor to the resistor's other lead. 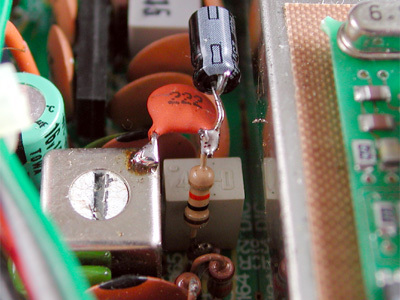 The other lead of the capacitor is soldered to the metal shield of the IF coil. Because the case is isolated from the transceiver's internal ground, I have not put a chassis terminal in the case, but used a 'pig tail' in stead. If a small hole is drilled next to the existing loudspeaker socket, the shielded wire can be led outside and terminated with a female cinch plug. 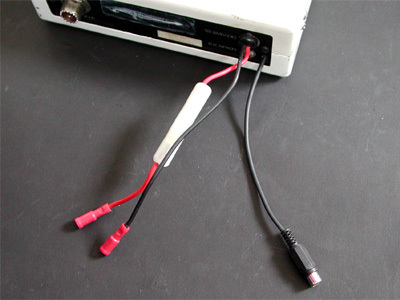 Of course, it is also possible to use a longer cord and use a 3.5 mm plug to connect the signal directly with your PC's line or microphone input.